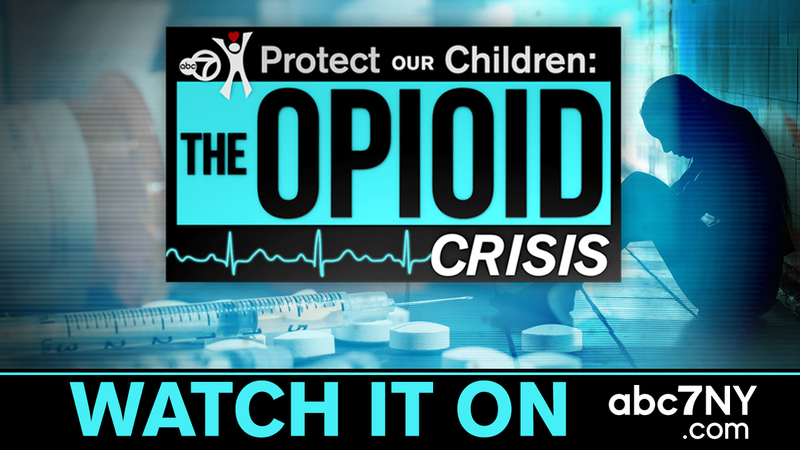 NEW YORK -- WABC-TV aired the special "PROTECT OUR CHILDREN: THE OPIOID CRISIS" on Saturday, March 30 at 7 p.m. (also to be re-run Sun. 3/31at 5:30 a.m.). The program is hosted by Eyewitness News Anchor Diana Williams and addresses the worst drug crisis in American history - the opioid crisis - which is truly a public health emergency. The program begins by pointing out the fact that the national death toll from drug overdoses has now reached record highs. The statistics are grim and show that prescription opioids have helped lead the way towards this epidemic and unfortunately children are the most vulnerable to the ill effects of drug usage. We feature families that have lost children and are fighting this epidemic by trying to raise awareness and change legislation. Parents are now having to confront this by becoming experts on subjects they'd rather not have engaged with. Common athletic injuries to rotator cuffs and ACL ligaments with simple surgeries were followed up with an over-prescription of Opiates, leading to lives ruined and subsequently lost due to the ensuing disease of addiction. One family describes the struggle to obtain help with barriers such as health insurance restrictions that limited the care available to them. They lost their son and were themselves stigmatized when they tried to raise awareness. Another family used their loss to focus their grief on successfully passing legislation in several States by creating the Patient Notification Law and working towards informing the public as to the addictive nature of prescribed medications. Yet another family has chosen to be active by funding Narcan training delivered by medical personnel. We are in an era where our prisons, hospitals and schools are all seeing a deluge of opioid overdoses and it is now as important to get Narcan Training as it is to learn CPR. WABC-TV employees signed up for this training as soon as it was offered and regardless of one's income, race and gender, the ability to save a life today using this medicine that reverses opioid overdoses is crucial. Adolescence is often a tough transition for parents and it's important for them to be able to recognize signs that a child may be having a problem. This special is the twenty second in a series from WABC-TV's "Protect Our Children" campaign that originated in 1998. The campaign includes informational safety messages, a website and campaign that continues to broadcast the pictures of missing children in every Eyewitness News Program. The previous specials have received six Emmy Awards, six "Gracie" Awards from the American Women in Radio-TV-Film (AWRT) and Awards from the National Center for Missing and Exploited Children, (NCMEC). All of the segments along with additional material, web chats and links to resources and agencies that can be of help will be posted on ABC7NY.com/Protect after the airing of the program.